complete all of the elements of care for their patients, some elements may be left unfinished. 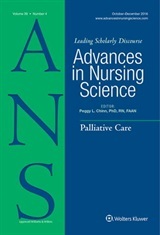 A review of the literature about unfinished nursing care (also known as missed care, tasks undone, or implicitly rationed care) revealed that patient turnover was a potential antecedent of unfinished nursing care. The concept of patient turnover is one with which every hospital nurse is familiar. Every hospital nurse admits, transfers, or discharges patients from their unit. Often, nurses experience this multiple times on their shift. Understanding the experience of patient turnover is almost intuitive for the hospital nurse. However, for me as a novice scientist, discussions about the influence of patient turnover on other phenomena (such as unfinished nursing care) were incomplete because the antecedents, defining attributes, and consequences of patient turnover were not well defined in the literature. Therefore, under the guidance of my dissertation co-chairs (and co-authors of this paper), Dr. Linda H. Yoder and Dr. Terry L. Jones, I undertook an analysis of patient turnover so that I could clearly operationalize the concept for my study. My next step is to publish the findings of my dissertation research. In the future, I intend to expand my study to other nursing units in the burn and/or military nursing environments. This concept analysis will be the basis on which I operationalize patient turnover in these future studies.